Flying Eagles Head Coach, Manu Garba, has offered some explanations why his team crashed out from the ongoing FIFA U-20 World Cup in New Zealand with a 1-0 defeat at the hands of Germany on Thursday. Expectations were high that the Eagles can go all the way to conquer the world like they did in the U17 cadre two years ago, but that was not to be as they were sent packing unceremoniously by the Germans in their Round of 16 clash at the Christchurch Stadium. “I believe that our players learnt a lot from this game and a big lesson in general from the tournament,” the disappointed Coach told FIFA.com. 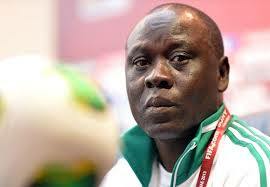 He continued: “The level at U-20s is far higher than at U-17s and Germany are a very tough and highly tactical team. Our players lost concentration at the crucial moment and this gave the Germans a chance to score. “There have been so many unexpected results in this tournament, but one can never predict the winner. I give my thanks to New Zealand for showing love for our team, the people here have made us feel at home,” the Coach said. While Nigeria is out of the tournament, Africa’s hope of winning the FIFA U20 World Cup now rests on Mali and Senegal who both are through to the Quarter finals. The Malians are billed to face the Germans who oust Nigeria while the Senegalese who are making their debut appearance in this tournament will be up against Uzbekistan.